Hope's Cafe: Burger Buddy Review and Giveaway!! Meet the Burger Buddy! A very simple-looking tool with a great purpose! Step 1: Heating up the water. I added season salt and dried onion flakes to press in some flavor. Step 2: Place the bottom piece of the Burger Buddy over a small saucepan. Step 4:...And quickly add your burger! Step 5: Press down on the burger gently but firmly, using the top piece of the Burger Buddy. Step 5: You have a delicious, healthier, less-greasy burger! I really enjoyed how quick and easy it was to get rid of the grease from my burgers with this handy tool. The burgers didn't have less flavor, or taste bland at all. Adding the seasonings really tasted good as well...the season salt and onions were actually pressed in to the burger, not just sprinkled on top! Guess what? 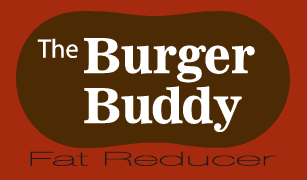 One of my readers will win a Burger Buddy of their own! Go to The Burger Buddy and tell me which feature you like best, or something you learned on the website. 1 entry-Follow The Burger Buddy on Twitter. 1 entry-Visit the Burger Buddy blog; comment on one of their posts (not just generic...actually tell them something!). Leave me a comment with a link to the post you commented on. This giveaway ends Monday, January 24, 2011, at 11:59 p.m. Please leave a valid email address in each comment, as this is how the winner will be notified. Winner will have 48 hours to respond, or another winner will be chosen. Giveaway open to US residents only. Disclaimer:I was not monetarily compensated in any way for this post. All thoughts and opinions are mine. All quotes taken from the The Burger Buddy website. This item reduces fat much better than the Foreman Grill. It is better than buying low fat meat because the burgers end up dry! I like how it takes out the grease. Please enter me. Thanks!